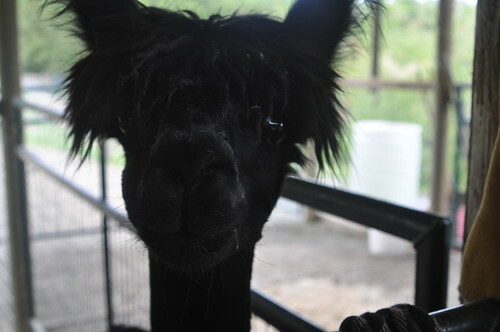 My friend Sarah, her parents own a farm named Brookfarm Alpacas. Sarah's family has lived on this farm for nearly 3 generations. It's history is steeped in family, that I always feel like a member when I am there. So nice, considering that my actual family lives in Minnesota. When Sarah and her parents, Mark and Debbie, asked us to help at shearing day - we were happy to oblige. 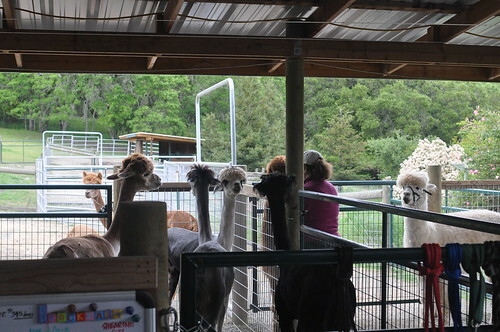 On the left are the alpacas that have already been sheared, on the right are those waiting in line. Ok, guy, now it's your turn. 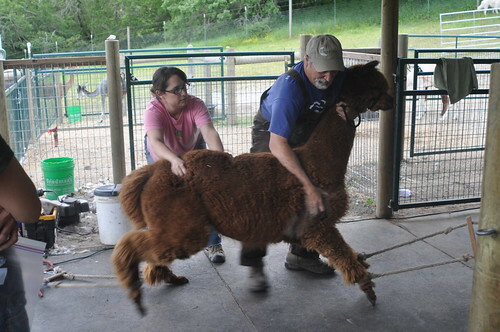 Debbie brings the alpaca to the scale to be weighed, first, before shearing. 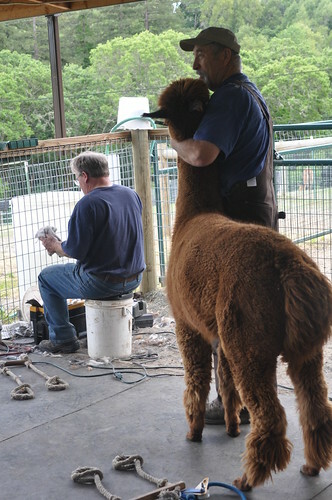 Sarah's Dad, Mark, reassures the alpaca that it's going to be ok as the shearer prepares his razor. Sarah's parents love their animals so much - it is so sweet. and stretched so if can safely be sheared. I swear the animals are not in pain - even though this might look a bit torturous upon 1st glance. Having that guy's belly exposed, it was really hard for me to stop myself from giving him a little tickle. Trust me, I restrained myself. 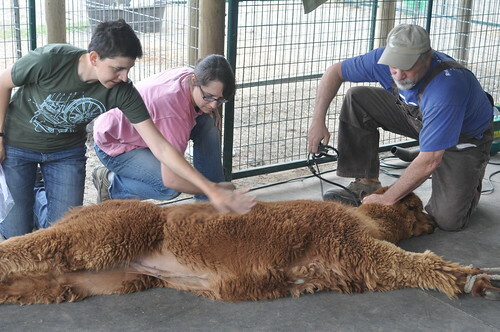 Here Mark stays with the alpaca while it is sheared. Adrienne and Sarah dust the coat. Now, unfortunately for this report, I had to put my camera down - I had to get to work! From here, the shearer comes over and starts to cut the fleece from the alpaca. Sarah, Adrienne, and I were each in charge of collecting a certain part of the fleece from the animal. The best parts of the fleece are reserved for making roving and yarn while the other parts are sent to be made into rugs. We are grateful that the Emery's invited us to be part of the farm for the day. If you would like to visit the farm, they accept visitors by appointment. To check out Sarah's family's gorgeous yarn and fiber, click here. Whoa, that is one giant woolly beast. Thanks for sharing your pix. Next time, I'd love to join you kids!!! 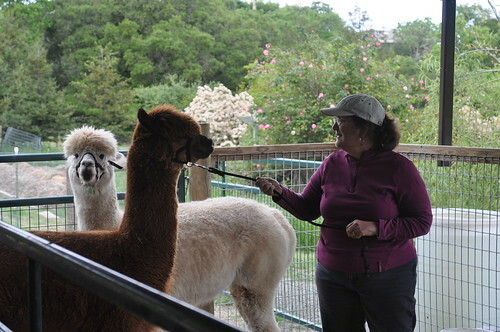 What a great narrative on our shearing day at Brookfarm Alpacas. We are so thankful you guys were there to help on short notice. Having the appointment moved up one day at the very last moment, due to rain of course!! !, put us in a bit of a bind with the helpers originally scheduled for the day. Here is my blog post on the day. Enjoy!